Do you think bus service is never as “permanent” as rail service? Well, it depends on how much infrastructure you build, and how proudly it announces the bus service as an essential part of the cityscape, both as icon and as opportunity. 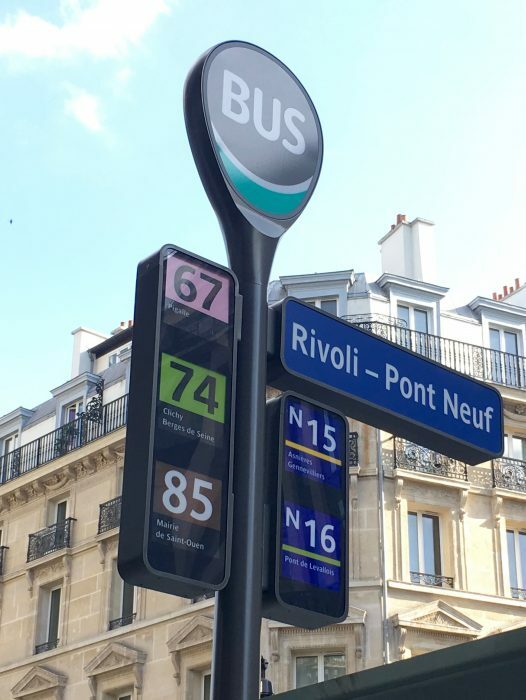 Each time I visit Paris there’s something new in its public transit, but these new bus stop signs, now standard across the city, are remarkable. They’re around 4m (12 ft) high, towering over the bus shelter to which they’re attached. At night they are the most prominent informational icons in the streetscape, by an order of magnitude. Every stop has a name, reaffirming your sense of your place in the city. 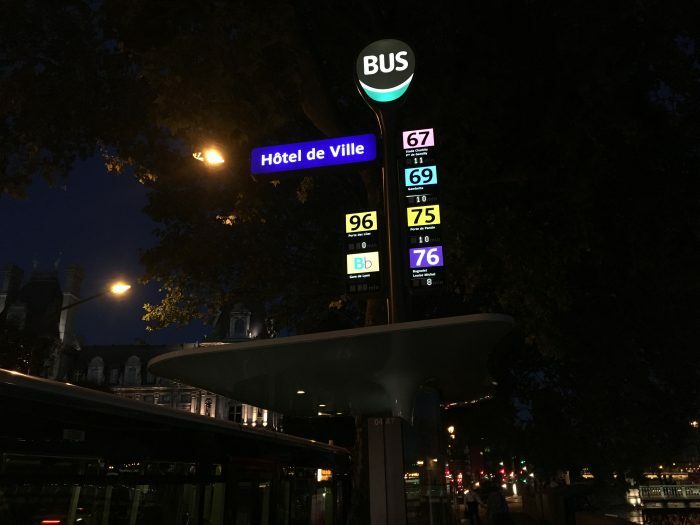 (At night, these are actually the easiest locational signs to read, so they have navigational value extending beyond transit.) For each route, there’s the number, the endpoint (indicating direction of travel) and the number of minutes until the next bus arrives. If you know the network, you don’t even have to look down to know where you are, and when the next bus is coming. Here’s one in the daytime, when the little realtime displays are harder to catch in a photo. I don’t have a good pic of the entire shelter, but it has everything you’d expect of a rail stop, including maps of each route, a diagram of the bus network, a diagram of the metro and regional rail network, and timetable and fare information. It also has more extensive realtime information displays, showing the next several buses departing. On the other hand, it doesn’t have the extraneous things that my architecture and built-environment friends often suggest, such as distinctive architectural designs or “community hub” features like coffee vending or (yes) lending libraries — all of which have been explored. A big city needs lots of bus stops, so the ideas that matter are the ones that scale. In any case, the more you respect your bus system, the more you can celebrate it for what it is, rather than expecting it to entertain us in ways that distract from the liberty it provides. When I lived in Paris in 1986, the buses and bus shelters were like what most Americans are used to: basic, functional, but sometimes dirty and poorly maintained. It was presumed, back then, that the Metro and regional rail systems were the serious transit, and that the buses didn’t matter much, and the infrastructure reinforced that message. All that has changed. Buses are so nice that you can scarcely distinguish them from trams (streetcars). Many streets have car-free lanes that buses can use. Now, with these pillars of information, bus stops are even easier to find than metro stations, and almost as easy to navigate. The more subways you have, the more surface transit you need. This excellent bus system operates right on top of the world’s densest metro network (in terms of stations/sq km). Almost everyone in Paris is near a metro station, but there are still plenty of markets (short trips, trips along paths not followed by metro) where surface transit is the right tool. Unless you already have streetcar tracks everywhere, the only surface transit that can cover your whole city, soon, is bus service. So if you want an effective transit system for everyone, you have to convey that the bus system matters, through network design, branding, and infrastructure. The order is important. First get the network design right, then develop branding that works with the network design. Finally, conceive infrastructure that serves and celebrates both. I could quibble with Paris on that last point. As with most bus networks, Paris’s seems to be more complex than it needs to be, though a modest simplification is underway, as you can see by playing the map here* . The signage doesn’t help us distinguish major routes from minor ones. 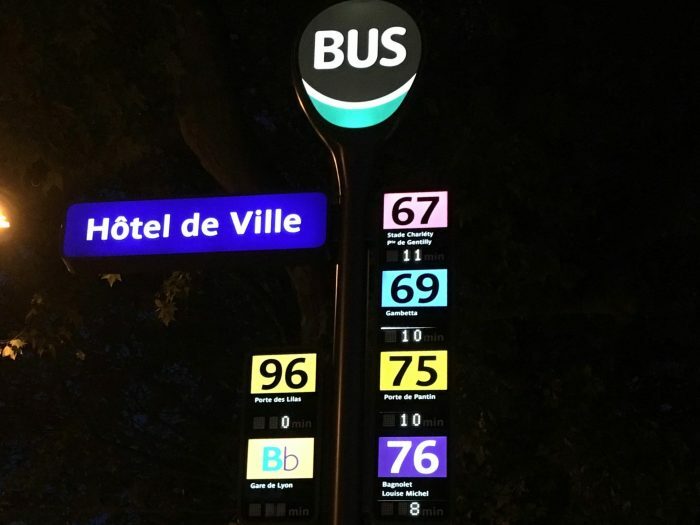 Imagine the extreme transparency that would arise from fusing Paris’s level of bus signage with Barcelona’s commitment to extreme simplicity and legibility in network design. But the big point is this: Buses can be as liberating and efficient as your city wants them to be. The more efficient and liberating they are, the more they deserve to be celebrated in infrastructure. The bus stop is one of the biggest signals, to everyone in the city, about the community’s attitude toward buses and their customers. * At this page, you can move the map left or right to see the changes. The current network is on the left, the proposed one on the right. It’s simpler but not that much simpler, and it still doesn’t help you distinguish major routes (high frequency, long duration) from minor ones (lower frequency, short duration). How do I find a hotel near good transit? Not (yet) via google! A recent post discussed Jeff Howard's hotels near transit maps suggested looking at Google Hotel Finder, a utility tucked away within Google Maps that purports to help you find a hotel based on travel time from some location. A user plops a pin on the map, and the tool draws isochrones based on drive, transit, and walk times, which supposedly show you the area of the city where hotels are within that travel time of your destination. So far, so good – I put a pin in downtown Portland, and Hotel Finder shows me a big blob in the center of the city that I can get to by transit within 15 minutes. It looks like there will be lots of hotels I can choose where I can quickly take transit into downtown. However, when we look a bit more closely, we can see a big problem with Google's approach. In this image, I have moved the pin to a corner near Reed College in Southeast Portland. This is a residential area bordering a low-density industrial district and the campus and fields of a small, exclusive liberal arts college. It is served by just one bus route, the 10-Harold, every 30 minutes. Yet according to Google, from this location, I'm just a short 15-minute trip from outer East Portland, or the inner Eastside Industrial District. The problem here is that Google is providing an isochrone of transit access that does not consider frequency, i.e waiting time. They assume that the bus shows up right when you need it..
Once I'm on the Harold bus, it's true that I might be able to take it from 28th far out into the east side in just 15 minutes. But depending upon when I arrived at the stop, I could wind up spending up to 45 minutes making the trip. If we assume an average wait of 15 minutes, or half the headway, the area shown by Google as within 15 minutes of the pin is actually more like 30 minutes! Imagine you are a person who is coming to a city for business, and you picked a hotel expecting to be able to travel to your meeting by transit in just 15 minutes. Yet when you walk out to the stop, or check a trip planing app, you find that you will wait longer than that just to catch the next bus! You might be late to your meeting, and the tool you used to pick the hotel would have failed to direct you to accommodations that met your desire to be a short transit trip from work. A more useful version of Hotel Finder would add waiting time. This would alter the isochrone in response to frequency, and more accurately show the area (and hotels) within a short transit trip of the desired location. We are surprised to see this kind of misleading info from the crack team at Google Transit. In presenting transit travel times that don't consider waiting, they are talking about transit as though it worked just like cars, doing a disservice to everyone who wants to consider transit when the choose a location. How do I find a hotel near good transit? Here's news you can use, or at least news I can use as an absurdly frequent flyer. All of the standard travel shopping sites make it very hard to assess the transit options from a hotel's location. At most they have distances and sometimes car travel times. So I often spend too long doing research, and pay too much for a hotel close to my destination when I might easily have stayed further away more cheaply if I knew good transit was there. This, therefore, is a really good tool. In the case of Washington DC, it helps you see all the hotels that are close (objectively close, not hotel-marketing-close) to a subway station. It's the work of Jeff Howard, and he's also done one for Atlanta's MARTA subway. You can get hints of similar output from Google, very crudely, by pointing Google Maps at a city and then specifying, say, "hotels near a DC Metro station," but Google is easily confused by excessively clear requests, and to Google, "near" means car-near, not transit-near. Someday, maybe Google will understand "hotel within 400m of a frequent transit stop," or even "hotel within 30 min frequent transit travel time from ___". But that's clearly a way off, and Google often seems more interested in interpreting vague search requests than replying to clearly stated ones. In any case, even a competent search engine wouldn't produce Jeff Howard's very useful feedback about hotels. Click on a station and there's a writeup about each station area, including a map showing the hotel's exact relationship to the station, and links to the hotels themselves, including a reservation widget. Nice work, Jeff! Google could transform how many people experience transit in about 15 minutes. Well, maybe a few days. They have the tools to do something that's a big effort for the transit agencies: Frequent Network maps. But in fact, any app-maker could do it too. Nate Wessel's guest post, on why trip planners can never replace or substitute for maps, gives us the clue. For the last three years, this blog has been preoccupied with the visualization of frequency. Frequency is freedom. Reducing the wait is the essence of what makes transit resemble the freedom we associate with cars, and it's also crucial to allowing multiple lines to function as a network. As this comes to be better understood, the concept of frequent network mapping is gradually spreading through the transit industry. I first made the case here, and explored some details here. The idea is spreading. If you don't believe me, just explore this blog's Frequent Networks category (let me know if you encounter other examples I should feature). Frequent lines are so special — as the network useful to busy people who can't build their lives around a timetable — that they need to stand out. If you haven't seen a map of the Frequent Network in your city, I contend that you really don't understand how your transit system works. As I argue at the links above, frequent network mapping can be transformative in helping people understand how a transit system actually functions, and why frequency is worth caring about. As Nate argues, and as I argued a few years ago, no trip planner will ever substitute for maps. What's more, no map of a single trip we care about will substitute for a map that actually shows you the network, just as most of us need to see maps of our city. The Frequent Network is especially crucial to see, and not just for the general public. Powerful people form ideas about transit from looking at maps, and if they can't see frequency, they are being misled about how the network works. Still, it takes time for ideas to penetrate a transit bureaucracy. Google, though, could do it tomorrow, by just setting up a little interface that reads midday frequencies out of the timetable data they already have, and draws a Frequent Network map. OK, quick automated mapping is often ugly. It might take a few weeks to make it beautiful. You might also want to give the user control of the frequency threshold. Service every 15 minutes is frequent in Phoenix but not in San Francisco. Actually, it doesn't even need Google. Given public GTFS feeds, anybody can build this app, right? Imagine arriving in an unfamiliar city and wanting to see where you can get to easily on transit. Or imagining thinking about a location decision, and wanting to make sure there's frequent service there, going to the places you go. Simplistic tools like WalkScore's Transit Score won't help you! You need to see the network yourself. Imagine that the resulting map is so useful that it comes to replace the convoluted transit information in most travel guides, which can't do much more than draw a map of a subway system, or give you a bunch of phone numbers if there isn't one. Tourists, too, don't like waiting long. What am I missing. If this makes sense, give me some credit for the idea, and take it away. Nate Wessel lives in Cincinnati, Ohio where for the last few years he's been working to improve public understanding of the local transit system. In 2011 he designed and published his own map of the system and he now writes the Cincinnati Transit Blog. Nate has a degree in urban planning from the University of Cincinnati from where he graduated this past June. I've heard quite a few times that Google Transit and similar technologies have made hand-rendered transit maps outdated. Being myself a maker of hand-made, tangible maps and having spent the last couple of years physically working with a lot of maps, I find myself with a bit of a gut reaction to this common claim. It's more than just a reaction to an existential threat though. My reaction is to an idea that would toss the baby out with the bathwater. Not only are lovingly created, tangible transit maps incredibly valuable to our understanding of the cities we live in, they're essential to the widespread use of transit. We'll need to go back to basics. What do maps do? What are maps? Why are they? Maps are like Cliffs-Notes for the physical world. We don't have time to read the whole book but we still need to get an idea what it's about before the test. You'll probably never manage to explore the entirety of one mid-size city let alone a country or the whole world. Yet we still want to see what's out there, where we could go if we wanted to and what we'd find when we got there. Understanding the shape and nature of the whole world or even one city through direct physical experience is a practical impossibility. We all need an understanding of the world beyond our fingertips; that's absolutely essential to modern human existence. It's why we have novels, to pick one example. A story from another life lets us share an experience we haven't yet had and perhaps never will. It lets us plumb the depths (and heights) of our own emotions and thoughts by momentarily opening ourselves up to the author's. We don't necessarily have to go there ourselves to learn something of love or sorrow(or downtown). Our innate curiosity pulls us to see what's possible in the world and within ourselves. The same goes for everything on TV, in print, and many things on the internet. Most media lets us reach beyond our own personal experience to learn something of the world we can't see directly. We absolutely need these things. They give us an understanding of the broader world and let us contextualize our own existence. They show us what's normal, and more importantly what's possible for ourselves; where we can go and what we can do. Kids can't dream of being astronauts if they've never heard of one. We can't speak seriously of knights in shining armour and chivalry and honor and of other deeply interesting ideas until we've read of their existence and felt something of it ourselves. In exactly the same way maps show us what's possible in the physical world. They tell us that Spain is a place in Europe, that Queens is connected to Manhattan by subways and bridges, and that it's not similarly connected to Britain. We can't think of taking transit until we know what transit does and doesn't. "Which line can I take to Queens?" "Are there coffee shops within walking distance of my current location?" "Exactly how much will the bus cost?" Filling this need for specific information is in part why the encyclopedia was so revolutionary during the Renaissance and why the internet can be so powerful today. The amount of precise information available to people is just exploding. The age of science and empiricism has given us the idea of bulk 'information' as something that can succinctly and precisely answer an isolated question. "Where is the nearest bike shop?" We now keep stock of them in a Google database that can return the answer in milliseconds. Often you can ask the most esoteric questions of the Internet and find a succinct and satisfying answer in less than a minute. That's stupendously useful for travellers and college students with deadlines. So maps (and other media generally) have two big functions: First to inform broadly and second to answer specifically. The informative function must necessarily precede the precise answering function. We need to know what's generally possible before we can know what exactly to ask. We need to know that transit is even an option before we can ask how exactly to use it. You tell Google Transit your location and exactly where you want to go. You tell it when you want to go there(usually now). It decides exactly the fastest way to do it, with perhaps a second option if it's a close call. It puts this exact path on a map and narrates directions like "turn left" or "wait here". In many circumstances, this is quite useful. Many people, if they're taking a one-time trip to somewhere they don't normally go, will just want a quick answer; if the trip is possible, a computerized map can tell them exactly how to get there and exactly how to get back. That's often a very handy thing. But Google Transit totally misses the first function of maps: informing us about the world, sating our curiosity, and showing us the possible. Google transit doesn't tell us anything about where transit goes generally. It makes us ask questions like "how do I get from exactly here to exactly there right now?" Without a basic understanding of what's possible it's left to hope that "here" is a decent place to start and that "there" is even a realistic possibility. Downtown Cincinnati for example has transit operating on just about every street, but you can't even spot it in the Google Transit interface before inquiring about a specific trip. …Google Transit suggests we take the #19 northward, but says nothing of the invisible #17 that runs parallel to it at more than twice the frequency. You can easily imagine someone who's once looked up their route on Google Transit regularly letting a #17 pass by while they wait for a #19 and complain about headways. Similar situations must happen a thousand times a day. Exploring a transit system with Google Transit is like blind men trying to understand an elephant by touch. This part is thick, this part is bumpy, we don't know how any of the parts attach to each other, and the whole thing is constantly, inexplicably moving. A thoughtfully hand-rendered transit map tells us what the elephant really is. It doesn't go into detail about the dimensions of it's toenails, but tells us of it's overall size, shape and temperament. It tells us that you might be able to ride the thing and that you probably don't want to try poking it with a sharp stick. Once we know these basics we can begin to ask exactly what the trunk is for. That's why hand-rendered system maps continue to be completely relevant in the heyday of the computer. A map like that of DC's Metro tells us more about the city and how to use the transit system than any GTFS feed ever could on it's own. A hand-rendered map must necessarily simplify a system, showing only some lines and only some landmarks. To do so it makes value judgements, something a computer has never yet been capable of. It does most of the hard work of understanding for us because a map-maker must understand the transit system before he can make a map of it; it's not just a matter of dumping all the routes into a GIS program. That deeper understanding of the transit system is an experience most people don't yet have and it's exactly what they're looking for when they explore a system map. Similarly, when they explore a novel they may be looking for a deeper understanding of the human condition, history, or their own lives. In either case, they're most essentially looking for their possibilities. "What is there?" "What is within my reach?" What is possible for me? Dense areas by definition get less space than their human value warrants on a topographically accurate map. Every famous transit map, whether it's DC's or New York's or London's does just the opposite; exploding dense, important areas like Downtown Manhattan and condensing suburban service. They do this not only because that makes them easier to draw, but because that emphasis on the dense is typically the actual emphasis of the transit system itself. A map that embodies the logic of a transit system is one that tells us most truly how the system works and most basically what we can do with it. We need something of that understanding before Google Transit can work well. We need to know what the elephant is. But that deep understanding of a transit system and of a city is so different for each system that no computer program could ever yet describe every system well. Google maps can't yet do it. It's something that just can't be automated. Google Transit can give us the answers but it can't give us the questions. And that's why it will never be enough for a transit agency to publish schedules to Google Transit without also publishing a substantial and thoughtfully developed system map made by people who are more than passingly familiar with the transit system and with the city.